Edo State Governor Mr. Godwin Obaseki said any nation that seeks to develop and be in the comity of advanced nation should pay attention to the institutions that helps to create and develop human capacity. He made this known while receiving management team of National Business and Technical Examinations Board (NABTEB) who visited him in Government House, Benin City on Tuesday. Obaseki said his administration sees a huge opportunity if only the state can take the lead and begin to convert and redirect the human capacity as it will lead to efficient productivity. “We see a huge opportunity for us as a state that if we can take the lead and begin to convert and redirect our human capacity, converting those skills and energy into ones that can lead to efficient productivities, the state will be better for it”. He said the strategy of his administration is so clear and it is to use opportunities of institutions like NABTEB to begin to look at the current educational system and infuse technical education into it. “This step will help our student to do something with their hands as they graduate from senior secondary school or at any phase of their lives. We want to work closely with your institution maybe we can start with 50 schools where we would ensure we have technical training component”. Obaseki said as his administration rolls out its other programme, she is very keen on Technical and Vocational Education Training (TVET). He said as the administration spend money to procure services, she is going to be working very closely with service provider to ensure that she link them into technical school, whether it’s in the area of Agriculture, electricity or manufacturing that will come there off. He said the way his administration approach issues is to bring people who are expertise and have the relevant experience to work out an implementation plan. “We are fortunate with Benin Technical College as we have raised the money, we have a master plan, we should go out in forth night to tender and start working immediately. It is not just rebuilding the school but we will be partnering building workshops, inviting companies to relocate around the school”. Earlier, the leader of the delegation and Registrar/Chief Executive of NABTEB Prof. (Mrs.) Ifeoma Isiugo-Abanihe congratulated the governor for his victory in the election as well as intimate the governor the activities of NABTEB, especially its benefit for the teeming population of youths in Nigeria. She commended the governor for his passion to accord technical and vocational education training its pride of place since the inception of his administration. 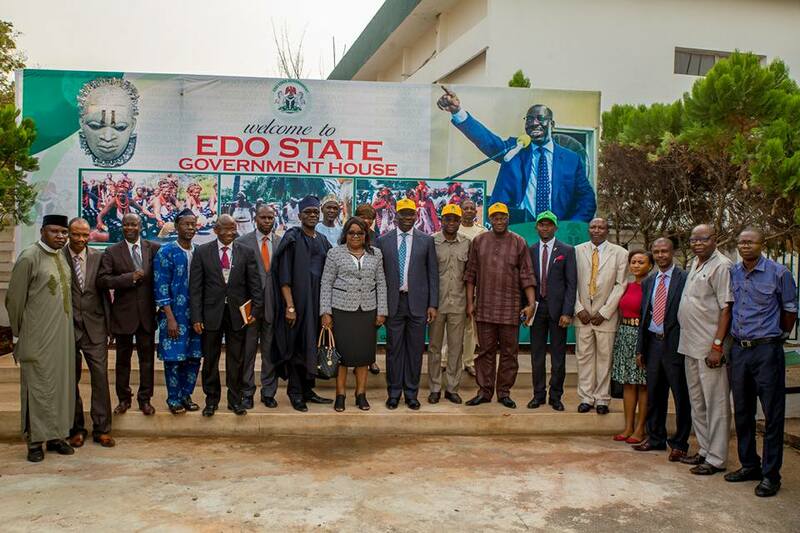 “It is important to mention that your Excellency’s patriotic passion for the acquisition and promotion of Technical Education binds us together, therefore makes mandatory our proposed collaboration with your government in our collective quest for youth empowerment, crime reduction and sustainable socio-economic development of Edo State”. She appealed to the governor to intervene in the recent issues between the board and the state government as regards facilities and accommodation to ensure that none of its activities was hampered.